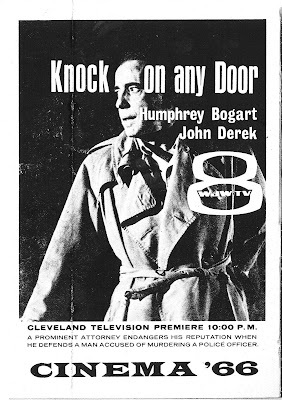 TV Guide Ad for KYW-TV 3..Heralding its new on air logo look beginning in January 1961. 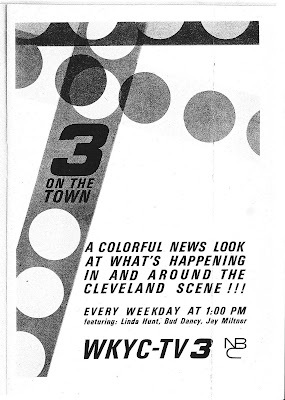 They would stay with this logo till early 1963 when they would begin using the famous Group W "3" which would be used for over 40 years at Channel 3 in Cleveland and Philadelphia. 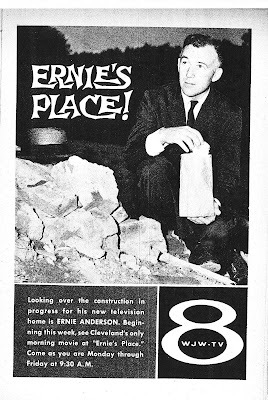 TV Guide Ad on the occasion of the premiere of "Ernie's Place" Monday, July 17, 1961. 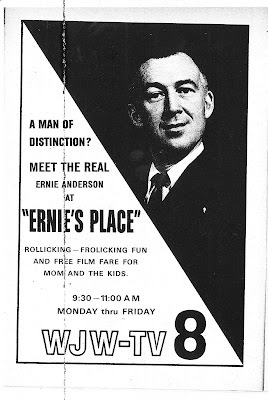 Today I'd like to look at one of Cleveland's Television icons of the 1960's..Ernie Anderson..More specifically, "Ernie's Place, a morning movie show hosted by Anderson in 1961 on WJW-TV 8. Anderson had been a disc jockey in his native New England and Albany, New York before moving to Cleveland around 1958 to work at, and get fired from, WHK-AM 1420..After which he did freelance radio work before being hired by KYW-3 in 1960. While there he met up with a young writer-comic named Tom Conway. The two hit it off quite well and they worked together on commercials, as well as Conway doing skits on KYW's "Big Wilson" Movie show. After they were let go by channel 3, Anderson moved over to WJW-TV 8 in 1961 as an announcer, bringing Conway with hin as a "director". 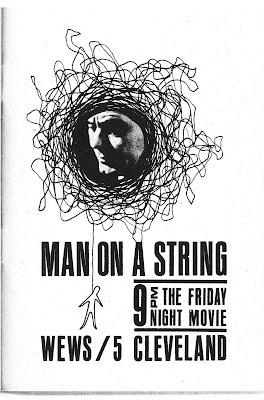 Though Conway was never a director in his life..
Ernie's Place began July 17, 1961 as an outgrowth of WJW-TV's "Morning Movie" which had aired 9:30-11AM..The first movie shown was "Henry Aldrich Swings It" from 1943. After it became obvious Conway wasnt a director, Chuck Schodowski was brought in to help smooth things out..Ernie and Chuck became lifelong friends. Ernie's Place was supposed to have guests but they couldnt get any, so Anderson and Conway did comedy skits in between movie breaks.. The show's time was moved up a half hour from 9-11AM September 4, 1961, replacing the Ed Allen exercise Show at 9. Ernie's Place was actually gaining popularity somewhat..But, by the end of 1961, Tom Conway had gotten offers from Hollywood and was gone much of the time..Ernie felt he couldnt carry on by himself..Eventually the show suffered and was cancelled Friday, January 5, 1962. 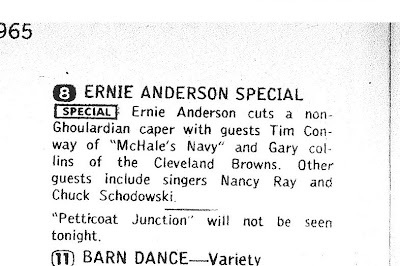 Tom (Now known as Tim) was preparing for his big break in "McHale's Navy" which would make him a star..Anderson, under contract to Channel 8, continued to be a booth announcer and doing other freelance announcing work until "Ghoulardi" began January 18, 1963. Ernie's Place was replaced Monday, January 8, 1962 by Kids host Bwana Don at 9, Jack LaLanne at 9:30, One day delay of As The World Turns at 10 and I Love Lucy reruns at 10:30. I am not absolutely sure, but I think this may have been the last scheduled early-mid morning movie series on any of Cleveland's 3 major tv stations..
Video of the first part of "End of an Era"..with mention of "Ernie's Place" and a small bit of Ernie's Place with Ernie Anderson and Tim Conway..
5-33 Flintstones-Classic Episode "The Hot Piano"
Classic Local Commercials..The Selling of Cleveland. I thought we'd take the blog in a different direction tonight..remembering some of the vintage local television commercials of days gone by..from those salesmen that told you "I REALLY wanna sell YOU a car NOW! "..and the like..Local commercials, in some instances became as popular as the shows they were advertising on..Some done in various forms for years and years...Some commercials were good, some bad but all memorable..Lets take a look at a few.. If you havent seen Higbee's...This is supposedly from 1967 but I dont recall this commercial airing that far back..
1971 Commercial for Red Barn's "Barnbuster"..While this wasnt Cleveland centered, Red Barns were all over Northeast Ohio until the 1980's..
1971 Burger King..Where Kids are King..
About 1970..The classic WEWS-TV 5 Eyewitness News Promo..
From the Late 1970's...The late Ted Knight did a series of memorable commercials for Southgate USA, a then-new Shopping Mall in the Cleveland suburbs using his "Ted Baxter" persona..two short commercials here. "Sohio Teperature Forecast"..1988 Radio spot from WNCI-FM Columbus with slides of classic Sohio pictures, signs, etc..Before its purchase by BP in 1991, Sohio had been involved in broadcasting in Ohio since the 1940's and its "Sohio Reporter" Radio program..migrating to TV from 1951-63...This radio commercial was the standard ad throughout the state from the 60's to the 90's..Notice the gas prices..around a dollar a gallon!! Channel 3 in Cleveland-60 years old in 2008. On October 31, 2008 WKYC-TV Channel 3 will celebrate their 60th anniversary on the air. While I would hope personally that Gannett would be planning an appropriate celebration, I'd like to begin the celebration a bit early.. In learning how to use YouTube, I have tried different software to edit videos..Been using Windows Movie Maker to make most of the things I have on YouTube..Thought Once again I would try something different..A Slideshow History of WKYC-TV.. Using the 35th Anniversary Video I featured awhile back with the 50's-60's vintage Audio clips from Jerry Immel, I have created a 5-minute slideshow featuring Faces, logos and ID's Through the History of TV 3 up to 1983..One problem..There is only between 3-4 minutes of slides and 5 minutes of audio..
October 1965-Changes on the Horizon.. Here is a listing for a somewhat unusual special..A chance for Ernie to shine outside the "Ghoulardi" persona..The Skits on this special have been shown for years on the Hoolihan and Big Chuck/Big Chuck and Lil John Show.. Ad for "3 On The Town"..In its first incarnation..As we mentioned in a series last year on this program, This show lasted 3 years and went through so many changes it seemingly couldnt build an audience..
October 1965 ad for Wally Kinnan, newly arrived from Philadelphia to become TV 3's main weather forecaster..Recently I did a profile on Kinnan here on the blog..
Today we'll take an in depth look at October, 1965..specifically the 23rd-29th of October..The major News Story was the Gemini 6 Manned spaceflight..All the networks covered the event thouroughly on their news programs..
11:45 WEWS-5 Johnny Carson Rerun-Don Rickles, Godfrey Cambridge, Marie Wilson and Frankie Randall..
9:30- WJW-8 Conversation-Martin Ross-Public Affairs Show in Prime Time-Discussion of the Mayor's Race with Incumbent Ralph Locher, Carl Stokes, Ralph Perk and Ralph McAllister. 4:30-WKYC-3 Woodrow-With the recent Ownership Change to NBC, Linn Sheldon cut back "Barnaby" to weekends, leaving the 4:30 spot weekdays for Clay Conroy's Woodrow the Woodsman. 4PM WKYC-3 Match Game-Gene Rayburn welcomes Edgar Bergen and a young Candace Bergen as panelists.. Midnight Gordon Cobbledick-Probably Sports Commentary-Cobbledick was the recently retired Cleveland Plain Dealer Sports Editor..
1:05 Movie-Valiant is the Word for Carrie-1936 Trivia-The Three Stooges played on this movie title in "Violent Is the Word for Curly" a 1938 Columbia Short..
Channel 3-25 hrs. 50 min. Channel 8-11 hrs. 55 min. 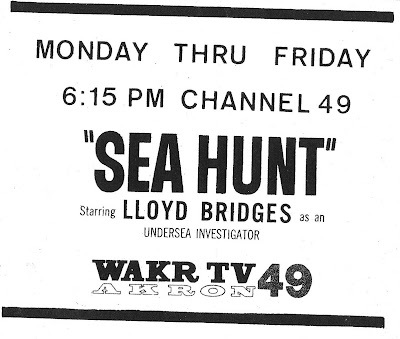 Channel 49-6 hrs. 15 min.